Image: Starbucks, Aphelleon/Shutterstock. Design: Kenzie Mastroe/SheKnows. We were so relieved that even though Christmas and New Year’s have passed, there would be a Starbucks Valentine’s Day menu to keep the “holiday” season going. Well, luckily for us, their themed menus aren’t stopping there. 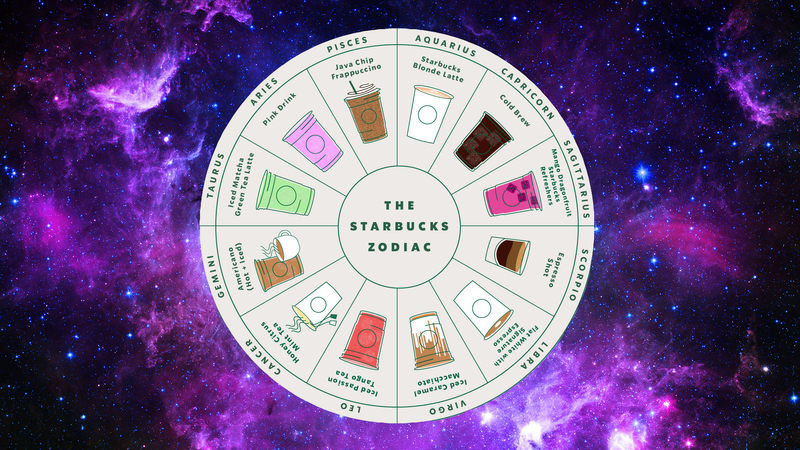 The chain just released the official 2019 Starbucks zodiac, a fun chart that lists the perfect menu item for each of the astrological signs — something to look forward to when you’re ordering your morning drink even when there isn’t a special holiday coming up. Roses are red, the stars are aligned. Find the perfect drink for your Valentine. ❤️ Check out our story for more. Now, even when there isn’t a holiday on the horizon, Starbucks fans can look to the chart to help choose a special beverage. The drinks run the gamut from hot to iced, fruity to roasted, and will definitely keep you hydrated all year long. If you don’t feel like ordering the specific drink for your sign, try this trick. Think of which of the astrological signs have qualities that you admire or aspire to, then order that drink instead. I’m an Aquarius, but sometimes, I wish I weren’t so scatterbrained and prone to procrastination. On those days, I’ll go for the official drink of super-organized Virgos: the iced caramel macchiato. Who knows? With each sip, you just might be getting closer to epitomizing those ideals yourself.